How Does the Volvo S60 R-Design Impress? The Volvo S60 R-Design represents one of the most elegant sports sedans on the market. Cruising down the road in a Volvo S60 R-Design isn't easily forgettable. People who check out the design and trim gain an indelible impression as well. The S60 R-Design is tough to beat in the looks department. Little touches such as gloss black insets on the grilles deliver huge visual benefits. The vehicle's look gains a nice stylistic touch. The front, lower, and rear grilles' artistry indeed come alive thanks to the inserts. Of course, the grilles themselves look awesome even sans inserts. The interior design makes for a more dynamic and comfortable driving experience. Contour seats and their accompanying Nappa leather and open grid textiles add to the overall feel. 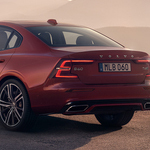 We at Sandberg Volvo Cars have difficult relaying our enthusiasm about the Volvo S60 R-Design in words. Take it for a test drive in Lynnwood to live out its true story.